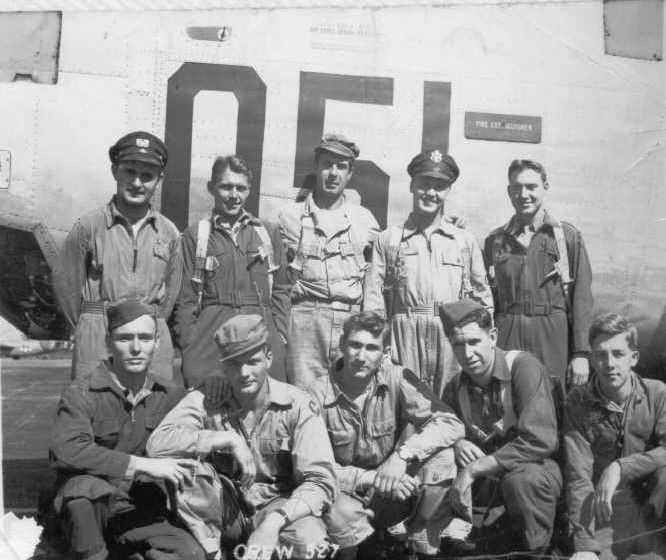 Edward McGlynn crew was assigned to the 514th Squadron. Edward McGlynn and his crew. Picture taken at Charleston Army Air Base. The crew was shot down on Feb 7, 1945. All survived and became POW's. Back row: F.O. Robert Wilcox (Ohio) - Bombardier, F.O. Walter Sliwinski (Philadelphia, PA) - Co-Pilot, Cpl. James Sheuchenko - Armorer/Gunner, F.O. Edward McGlynn (Rhode Island) - Pilot, F.O. Robert Koehler (Syracuse, NY) - Navigator. Front row: P.F.C. William Williams (Texas) - Assistant Engineer, P.F.C. Alfred Young (Mass.) - Radio Gunner, P.F.C. Ray Waner (Chicago, IL) - Radio Gunner, P.F.C. George Taylor (Mass) - Assistant Armorer, Cpl. Don White (PA) - Engineer. Click here to read the story of the day the crew was shot down.